Russell and his younger brother Rodney live in the economically-depressed Rust Belt, and have always dreamed of escaping and finding better lives. But when a cruel twist of fate lands Russell in prison, his brother becomes involved with one of the most violent and ruthless crime rings in the Northeast – a mistake that will cost him everything. Once released, Russell must choose between his own freedom, or risk it all to seek justice for his brother. If you’re expecting a hard-hitting action movie, then you’ll be disappointed. This film is tough, but not in a physical way. It’s a dark, depressing and hopeless portray of a moribund industrial city. A slow moving movie that tells the story of the brothers Baze. Russell is the one who tackles life in a conventional way by going to work himself to the bone for a meager wage in a steel factory. Rodney is the energetic U.S. marine who has already done a few tours abroad and clearly suffers from that. He doesn’t want to have an ordinary job. He rather borrows some money at a local bookie and gambles on horse racing. Either he tries to collect a few dollars by participating in illegal organized fist fights. However, he has a problem and that’s his sometimes emerging rage that makes him forget the precise instructions. Christian Bale plays an outstanding role here and should have gotten a nomination for this part instead of the one in that dreadful movie “American Hustle“. He radiates an intense tranquility and also tries to calm down his brother. The only thing I was wondering is whether he had a criminal past. The love for his girlfriend and his father, who’s in a critical condition, seem truly sincere. It’s a man whose eyes say everything. The fatal accident he caused made him spend some time behind bars. But even that won’t break him. The day he’s released and the meeting with his girlfriend, who meanwhile left him, are two strong snapshots in the film. Casey Affleck is the opposite. A cauldron of pent-up anger and frustration that arose during his missions abroad where he experienced stuff he can’t talk about and so he bottles up these certain situations. He plays it so amazingly well. The restrained anger relative to his brother. It’s someone with a short fuse who is about to explode. And he does that during the fights. Until he gets involved with a community that lives in the mountains and who have their own laws. The interaction between the two brothers is magnificent. They are well attuned to each other. The older brother who does all the effort to keep the younger rebellious brother on a short leash. Even repaying his debts he made with gambling. It’s evident that the respect for each other and the brotherly love is mutual. The frequent visits of Rodney in prison is prove of that. Also the excuse note Russell gets after they had a feud, makes that clear. Russell isn’t realizing that he’ll never see his brother alive again. Woody Harrelson plays the dangerous DeGroat in a masterly way. The opening scene at the drive-in makes it clear that he’s a psychopathic violent person who fears nobody and won’t go out of the way for anybody. The devilish grimace and sly sophisticated smile fit perfectly with him. Same traits as his character in “Natural Born Killers“. Woody has the stature and the attitude to play such a character. He sometimes actually looks fairly friendly with his winning smile, only to change into a deadly person in a flash. The acting performance of Forest Whitaker wasn’t that great. The moment he tells Russell the news about his brother, was truly abominable. However I think Forest is a brilliant actor. An off day probably. I can imagine such dreary and petty towns exist in the U.S. where people are struggling to survive and even retreat into isolation, to found an independent community where crime and violence is normal. Besides the fact that this is just an ordinary revenge movie it also has other elements that don’t have anything to do or add to the main theme, but are subtly worked out to fit into the complete story. The only disappointment was the end. If I was Russell, the retaliation would take a long time. 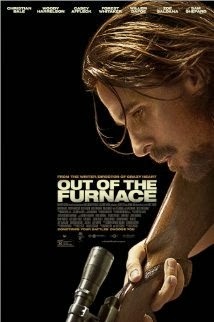 “Out of the furnace” is a story about people who fight. Fighting for an income. Literally and figuratively. And the dilemma to take the law into your own hands or not. The sweet revenge. In the end I thought it was a top movie. Found your blog. It is full of really good information. Thank you for sharing. If you ever need service on Denver furnace installation, air conditioner or water heater please visit us at rheemteamcomfort.com. We would love it if you would have a look at some of our blogs and let us know your thoughts.